Western literature is abound with canine references, and the dog has been portrayed in sculpture and paintings since ancient times, almost invariably shown as a loyal companion of man. In the field of science, on the other hand, researchers have almost totally ignored the role of the dog - and other pet animals-whether the object under study was child development, or therapy for the old or the mentally ill. This neglect is all the more strange, as famous scientists have commented on the human-dog relationship, including Charles Darwin in his book The Expression of Emotions in Man and Animals, first published in 1872. Early this century, Sigmund Freud reported that his pet Chow was frequently present during psychoanalysis sessions with his patients, and more Man's best friend can become a status symbol, indicating a certain social standing and the owner's extrovert nature Friend and confidant is one of the most valued aspects of ownership - a dog never disagrees nor betrays a secret recently, Nobel Prize winner Konrad Lorenz wrote of the human-dog relationship in his two books Man Meets Dog and King Solomon's Ring. In the last few decades, scientists have begun to pay serious attention to this form of psychiatry, the impulse being generally attributed to a practising New York psychiatrist, Boris Levinson. In 1961 he presented a paper on 'the dog as co-therapist', in which he cited case histories, where he believed the presence of his pet dog during psychiatric consultations had hastened the patients' recovery. Dr Levinson examined the relationship further in two books about the relationship between people and pets, and emphasized in particular the benefit children derive from the companionship with a dog. Since then, much new research material has seen the light of day, which seems to prove that dogs are valuable not only to growing children, but also have psychological benefits for adults and especially for the elderly and housebound. Our attitude to dogs, both historically and in the present, is often ambivalent. 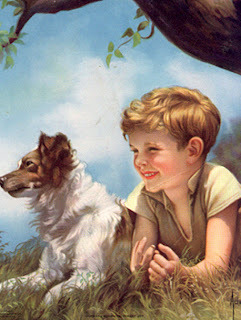 At one moment the dog is depicted as man's best friend, the next it becomes a derogatory comparison, as in references to 'running dog lackeys a dog's life' or 'going to the dogs'. The anthropologist, Edmund Leach, has described the dog as 'lying between culture and nature'. This conflict affects our attitude, which variously attributes human qualities to dogs and variously views them strictly as animals. For most of the time, an owner treats the dog as a loved friend and companion, conferring on it honorary human status; however, this status can be withdrawn on occasions of emotional stress when the owner becomes angry with the dog because it cannot respond like a human.